It is 1916. Two years have past since the launch of World War One. 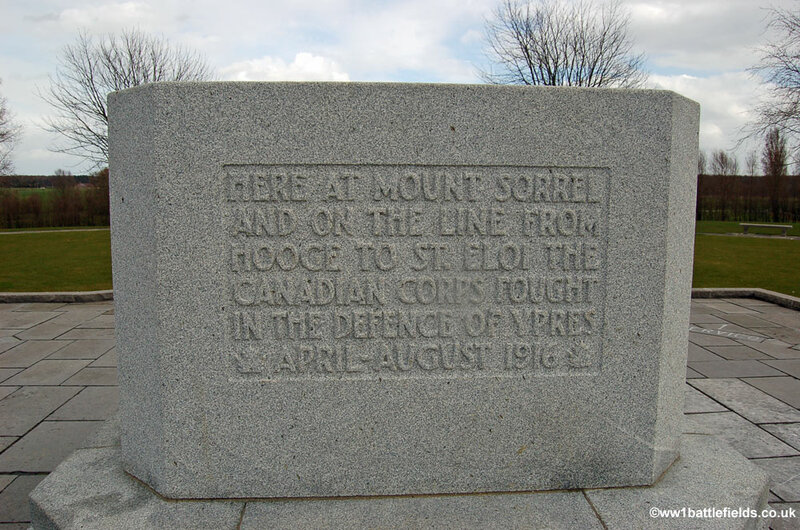 The Canadian forces were burdened with the task of looking over the nearby town of Ypres and also serve as a lookout point from Hill 62 and the other hills in the general area. For the most part, the Second and Third divisions were responsible to cover the area. No other allied forces were available to assist, except for some British artillery (British preparing for assault on Somme). Trenches lined the area, and there was generally ample cover provided by the many trees in Sanctuary Wood. In the beginning, the wood was used as a meeting place for the Canadians to regroup, as well as for the wounded to be healed and rest. It is no wonder, then, that it was named as it was. But the name would not fit the area for long. Realizing the advantage of the hills, forest, and position overlooking Allied-controlled Ypres, the Canadians foresaw a major chance for a German attack on the hills. Their instinct did not fail them. On June 2nd, the German forces took the area with heavy artillery fire and mines. Of the 702 men stationed at these posts, only about 76 survived. By June 6th, Hills 60 and 62 were lost. The battle was, for the meantime, over, and the Canadians were forced to retreat. Immediate attempts were made to try and recapture the hill, but none ended up to be successful. Knowing that time was limited, Lieutenant-General Sir Julian Byng and Major-General Arthur Currie prepared the troops and worked out strategies in order to gain the lost territory back. The counterattack started with much careful planning and preparation. Every single soldier knew his role, where he was going (layout of the land), and things were organised so that things could continue if commanding officers fell in the battle. First, the artillery was to strike. This weakened their defenses as well as got the defenders on alert that infantry were to rush the hill. But when none came, they were left in the open at their positions and were shot at. they went back. This contined for some time, until they were not sure whether or not infantry would storm them. Whenever artillery struck, they were left in the open at their positions and were vulnerable to attack. Eventually, once the Germans were disorganized and distracted, the Canadians attacked. On June 13th at 1:30 AM, the Canadian divisions fought their way to victory and regained the territory. After World War I, the site was claimed by the proper owners (the Schier family) and was turned into a private museum. During WW2, it was temporarily closed and the artefacts were well-hidden from the German forces who searched the area on a constant basis. Since then, it’s been open to inform people on the events that occured there and the impacts Canadians had there. Many of the original artifacts, weaponry, and other relics are located here. But it is probably best known for its preservation of the many trenches and tunnels there. The museum contains many interesting photographs, displays, and other such items and sights which will surely fill the avid adventurer on real experiences. The battle at Hill 62 and Sanctuary Wood lasted a total of 5 monthes and the result of careful planning and strategy earned Canadians their pride and bravery in the Great War. But as always, there was a heavy price to pay for their success. 8430 Canadians died fighting in this battle. But it was through courage and valor and the spirit of Canadian soldiers pulled through to help the Allied Forces gain a major victory, which affected the outcome of the War. It was the first real show of Canadian participation in the War, and what an impression it must of put on countries around the world to have heard this story. Just another reason to be a proud Canadian . If you have any comments, questions, and suggestions to help improve this article please leave a response. I am open to anything that I’ve missed or can improve on. Posted in Sanctuary Wood and Hill 62. Nigel Burton (who goes byÂ Nige820 over at Flickr) captured some great shots of the First World War sites around Ypres during his own trip there. To me his photographs convey a sense of timelessness for these scenes of desolation. 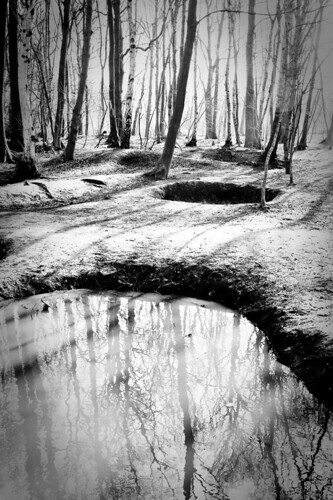 My favourite is this shot of some existing crater holes, preserved at Sanctuary Wood. It’s been almost 100 years since the Great War, and there are parts of Europe still visibly scarred from the artillery shells, mines, and other brutal weapons. The human cost of the war was of course devastating, but the sheer scale of physical destruction and the reshaping of the land itself by human action is easy to overlook. I just hope we don’t stumble upon any UXO. You can see all of Nige’s Flickr photo set here. Go check it out. Unsurprisingly, unexploded ordinance (especially landmines) is a major problem facing people in more modern conflicts as well. Visit the Canadian Landmines Foundation for more info or to help. Posted in Military History and Passchendaele and Sanctuary Wood and Hill 62 and The Ypres Salient and Uncategorized.